I decided I would finish my own Personal Blog Challenge with a Bang! And I would give five cards -- similar but different. I chose to do a set of One Sheet Wonder cards. I chose to do a 6 inch by 6 inch card stock One Sheet Wonder from which to cut the pieces for the five cards I would do. This is the set of five cards I made. To give the varying shades of color on the card stock I cut up I used 4 colors of the Art Anthology Colorations sprays. 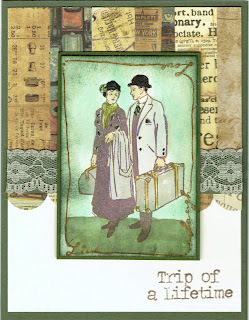 Then I randomly stamped the couple, the small suit case and the words from the Technique Junkie stamp set Vintage Travel Cases - http://techniquejunkies.com/vintage-travel-cases-set-of-5/. And of course all five cards are stamped with Vintage Travel Cases - http://techniquejunkies.com/vintage-travel-cases-set-of-5/. I will give you the information on the verses for each card individually. All stamps used on these cards are Technique Junkie stamps. I will give you the direct link for each verse stamp. And this is the cutting diagram I made up for these cards. The x's represent areas I did not use. And now for each individual card -- Card One. Card One uses the four 1 x 1-1/2 inch pieces of cut card stock. 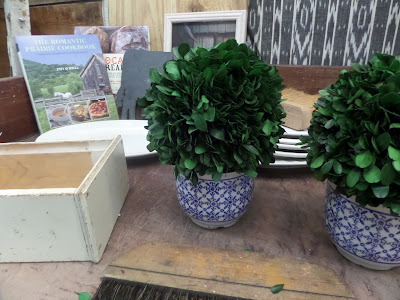 Plus I layered each small piece on green and then all four on one piece of Rich Razzleberry. The verse stamp is Technique Junkie Stamp Dance in the Rain - http://techniquejunkies.com/dance-in-the-rain/. Card Two uses the one of the 1-3/4 by 3 inch pieces of card stock. It is layered on green and then on the purple color. The verse is from the Mae West Sentiments - http://techniquejunkies.com/mae-west-sentiments/. I used twisted yarn and a flower sprayed with the purple Art Anthology Colorations spray. The clock is tied on underneath the bow. 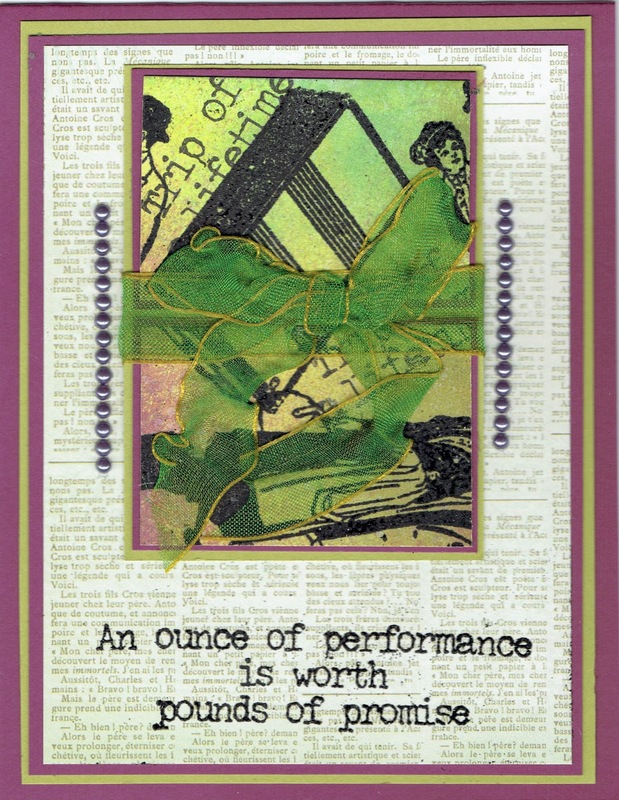 Card Three -- The one inch squares are used here, each mounted on green and then layered on a yellow sheet of patterned background paper, which is layered on white, then on purple, then on white, and then on green. The verse is Kind Word - http://techniquejunkies.com/kind-word/. Card Four uses one of the 2 - 1/4 x 3 inch piece of stock, layered on purple, layered on green, and then layered on a patterned piece of background paper. Ribbons and beads embellish the focal image. The verse is from the Mae West Sentiments - http://techniquejunkies.com/mae-west-sentiments/. 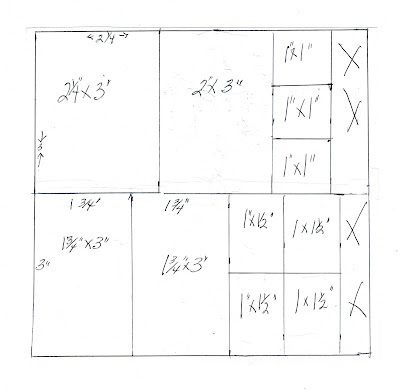 And finally Card Five uses the two remaining larger pieces -- the 1- 3/4 x 3 inches, and the 2 x 3 inch pieces. They were mounted on purple card stick and then on green stock. Then positioned on a multi-colored piece of background paper. I wish you could see those colors. I tied a ribbon around all but the base card stock and centered the bow over the the spot where the two sections overlap. I heated the bow with a heat gun for just a few seconds in order to get ribbon to get a crinkled vintage look. Then I adhered several burgundy ribbon rosettes over the knot in the bow with glue dots. I put one more by the bead swirl. The verse comes from the set Thing I want to Do - http://techniquejunkies.com/things-i-want-to-do/. This set has just a lot of fun sayings. I love it! So during the month on February I hope I have inspired you to think outside the box a bit. I hope it has caused to at least think about buying this set Vintage Travel Cases - http://techniquejunkies.com/vintage-travel-cases-set-of-5/ . And tomorrow -- well that is a new Blog Hop Day for the March Releases! I wonder what will be in store for us tomorrow! 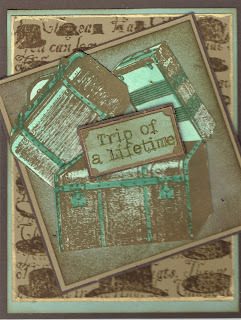 Since my personal challenge was to create lots of cards with the Technique Junkie Stamps Vintage Travel Cases - http://techniquejunkies.com/vintage-travel-cases-set-of-5/ -- that is just I did with this card. But I also used the Technique Junkie Stamp Pont Alexandre III - http://techniquejunkies.com/pont-alexandre-iii/. And if you know that stamp at all, you will know it shows a man there on the bridge. I knew that I wanted to put the focal couple in his place so I masked him out of the image. So I looked at the stamp carefully and determined when the couple should be in relationship to where the man in the stamp. 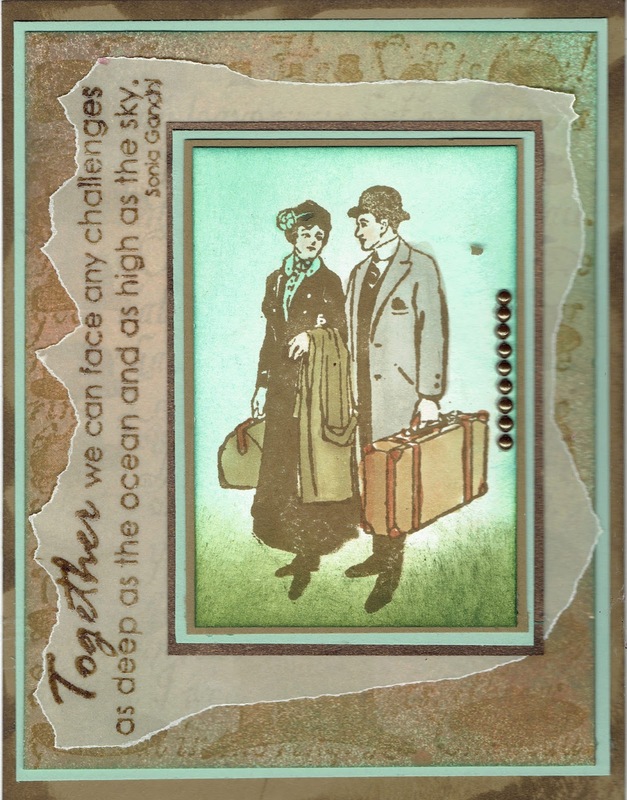 Then I stamped the couple slightly off center and near the bottom. I restamped the area with the couple on a Post-It- Note, cut them out and laid the Post-It-Note on the couple. Make sure you stamp your mask on the sticky edge of the Post-It- Note. Then I stamped the man, then cut him out, and laid him over the stamp before I reinked it with Memento back ink. Then I removed the mask of the man and stamped the Pont Alexandre III stamp over the couple. Because of the mask none the background stamp got on the couple -- yeah! While the mask on the couple was still place, I sprayed the light brown spray Art Anthology Colorations Spray over the wood part of the bridge. I removed mask of the couple and colored them in with my Copics markers. I sponged in the sky. 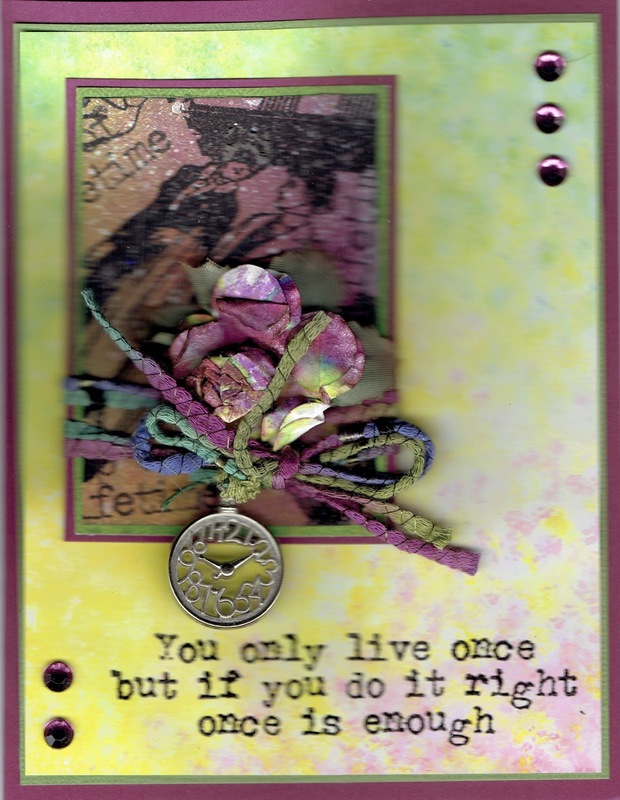 This card was a challenge for me to make because I knew how I wanted the end result to look, and I knew If I didn't do each step almost perfectly in the stamping, it could be a mess. Instead I think it looked great! 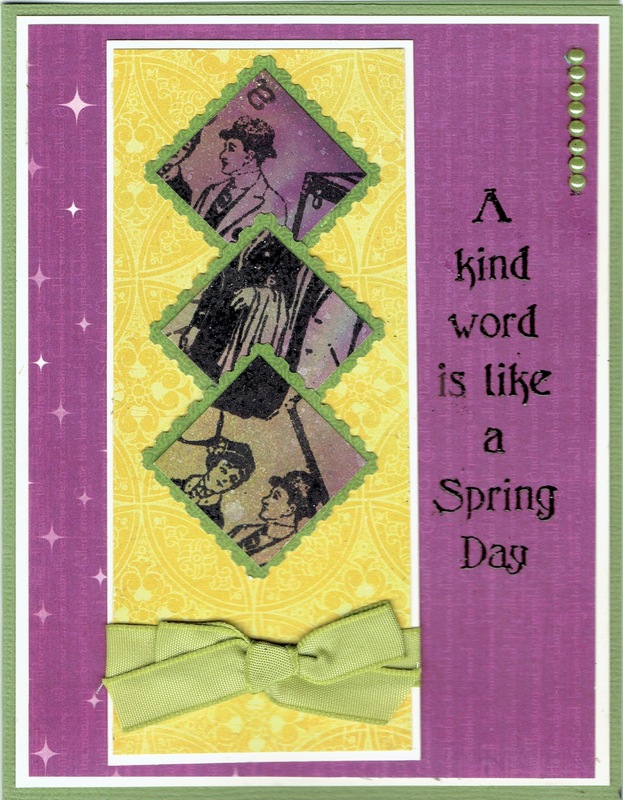 I used this stamp from the Technique Junkie stamp set called Grateful Flourish Sentiments http://techniquejunkies.com/grateful-flourish-sentiments-set-of-7/. 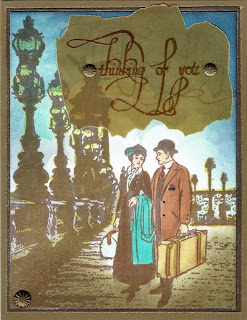 I stamped and heat embossed on brown vellum. You can see other flourishes underneath. That adds some texture. For this card I arranged strips of a solid card stock that coordinated with a pattern background paper. Then I chose several frame dies that would fit together. I chose to use the same papers already used on the card to create the various frames. 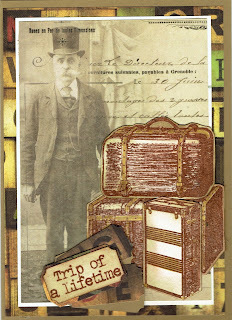 For the final frame, I used the focal image from the Technique Junkie Stamps Vintage Travel Cases - http://techniquejunkies.com/vintage-travel-cases-set-of-5/. I added a coordinating light teal ruffled ribbon on the side of the stack of the framed focal image. This was laid over a strip three ribbons -- one teal, and 2 light brown ribbons. When I tell you the finished card is lovelier in person, you will just have to believe me. 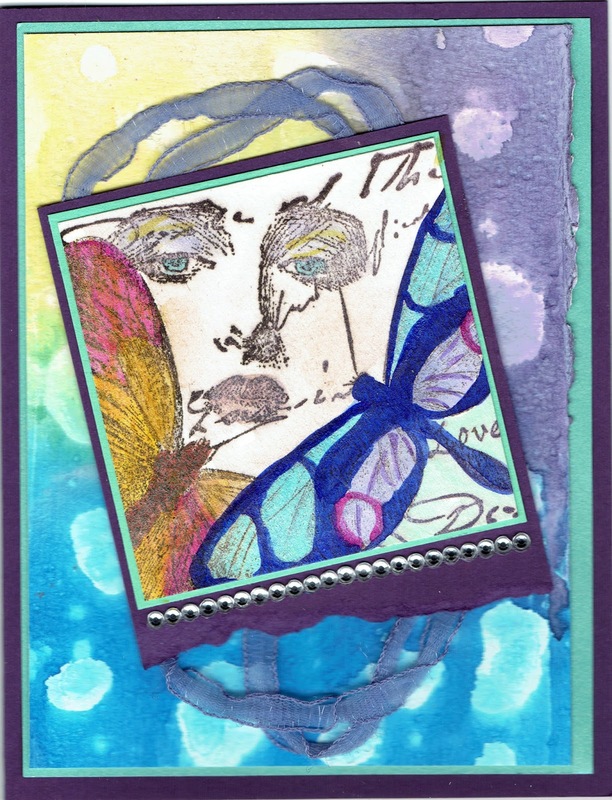 This Circle Strip Technique comes from the December 2013 issue of the Technique Junkie newsletter. 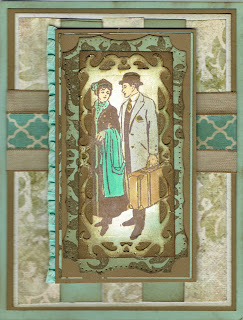 I used a variety of Vintage papers to create the look for this card. I added a strip of lace in the middle of the card. I placed the Circle strips on white card stock and layered it on dark green card stock. First I stamped the Technique Junkie Live Laugh Love frame stamp http://techniquejunkies.com/live-love-laugh-frame/ on a piece of white card stock. Then I stamped the couple from Technique Junkies Vintage Travel Cases http://techniquejunkies.com/vintage-travel-cases-set-of-5/ in the middle of the frame. I colored the couple and the grass with my Copic markers. Then I used my glitter marker and carefully went over the words and the squiggly frame line around the edge. 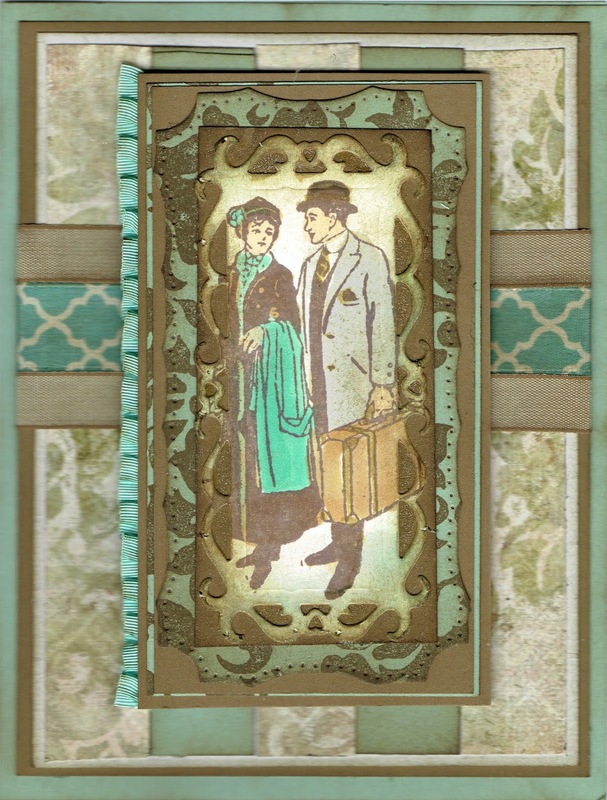 I layered this focal image on dark green card stock and adhered it over the lace on foam tabs to pop it up a bit. 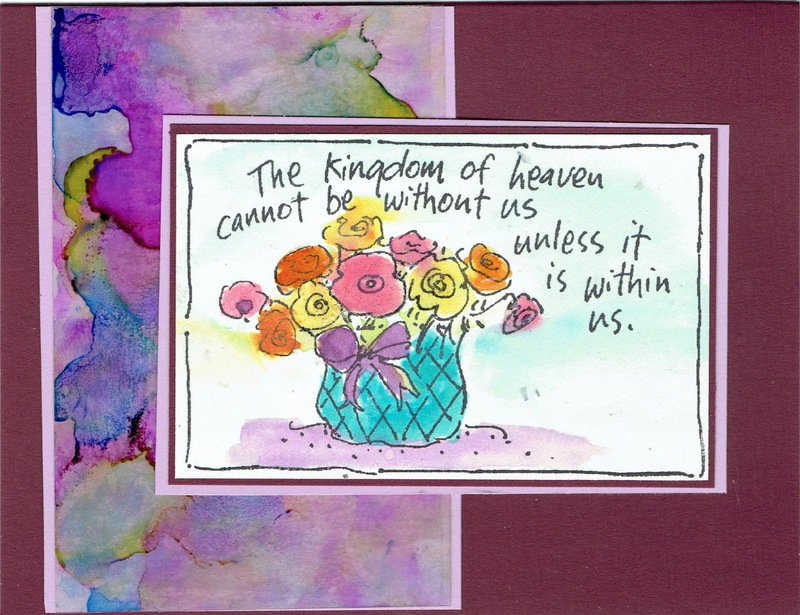 Then I stamped the words on with brown ink in the bottom right corner of the white card stock. I found this gorgeous Vintage Rose background paper in my stash of papers. Am I the only one who buys lovely papers and then forgets they are there to be used? The paper had roses in opposite corners so I took those rose and "fussy cit" around them. I put one corner of roses in the bottom left corner, and finished cutting a few other roses from the other corner. I adhered the roses down on a piece of vanilla card stock. Then that vanilla card stock with the rose was adhered to another piece of back ground paper with a more muted floral design. All of that was adhered to a pale pink card stock. I used sponge daubers to brighten roses and the leaves just a bit. There was a third piece of roses paper with a small rose in the corner. I used a tag punch and punched it out. However, it was a thin piece of background paper so I adhered it to a scrap of vanilla card stock. Then I trimmed around the edge leaving a very small border that i sponged with color. Then I stamped the couple from the Technique Junkie stamp set Vintage Travel Cases (http://techniquejunkies.com/vintage-travel-cases-set-of-5/ with gray Memento ink. I let it dry a bit and then colored in the couple with my Copic markers. The tag was stamped with a verse from the Technique Junkie stamp set called Wings Quotes - http://techniquejunkies.com/wings-quotes/. It was heat embossed with detail black embossing powder. I added some punched out leaves, some ribbons behind the tag, and a small rhinestone. The tag was popped up with foam pieces. Anyone who is a serious stamper, and is invested in this craft, and follows new stuff knows who Tim Holtz is. His blog is one I faithfully follow and read. 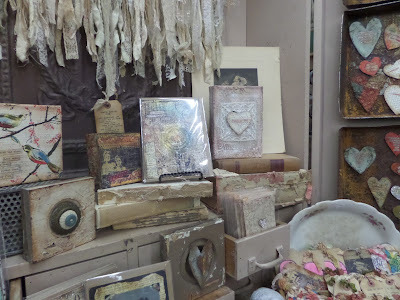 In January Tim posted about a visit to a wonderful antique shop called Sweet Salvage in Phoenix, Arizona. It is only opened one weekend a month! Since I had already planned a trip to Arizona I googled the name for more information. I discovered that the one weekend a month they are open to the public was during the time I would be in Mesa! So I asked my friends if they would be interested in going shopping with me there --and they were. I mainly wanted to see what there was available. I saw some very neat things but not enough room in my suitcase! Aren't those neat looking things! And then I glanced up and who did I see? 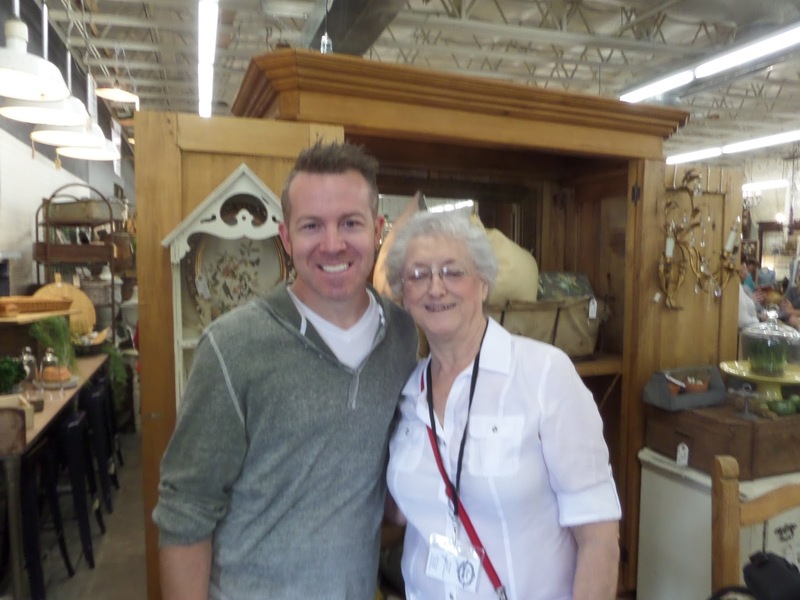 Tim Holtz and Mario! Both he and Mario were very gracious! Mario took the picture. I found out they were on their way to London, but their flight was delayed so they decided at the spur of the moment to stop by Sweet Salvage! It was a special moment for me! I told him about Technique Junkie Stamps and he said he would check them out and wrote down the name! Have you had a cool surprise? Get inky! I use a wide variety of background papers and punched out quite a few hexagons in order to have enough. Then I punch out the hexagon from one side of the vanilla layer. I stamped the couple from the Technique Junkie Stamps Vintage Travel Cases - http://techniquejunkies.com/vintage-travel-cases-set-of-5/ on a scrap of white card stock in Memento brown ink. I colored them in with my Copic Markers and used my Wink of Stella pen over the coloring. I place the white card stock scrap behind the vanilla layer so that the couple showed though before adhering it to the Soft Suede card stock. 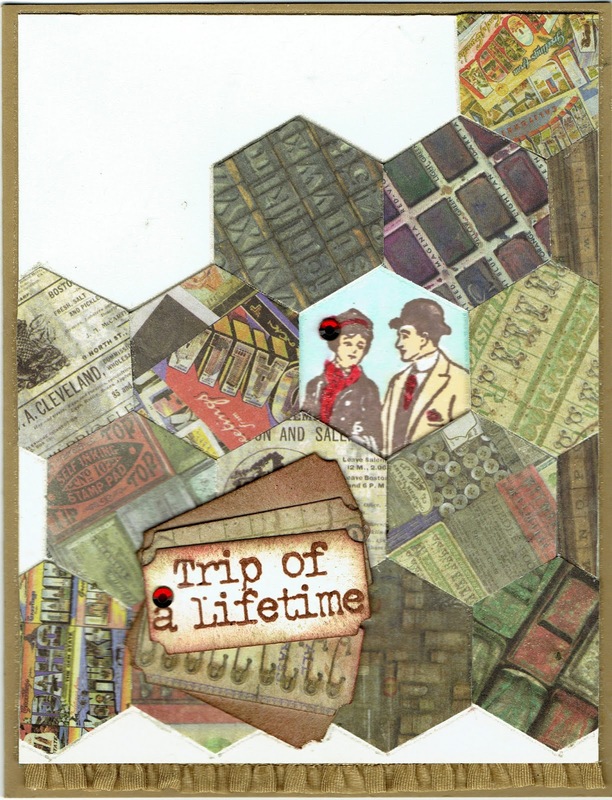 Then I placed the hexagon pieces around the couple in a quilting fashion making sure the same kinds of background paper are not the same right next to each other. I adhered each piece as I went along. I punched out three tickets from scraps of background papers, and from vanilla card stock after the words were stamped and heat embossed. I used a glitter pen to go around each seam in the "quilt," and I used Wink of Stella brush marker pen over all of the hexagon pieces. Then a few rhinestones were added for the final embellishments. As I have been creating cards with this challenge, I remembered the vintage looking die cuts I used on this card. I decided to use them! They would go great with the Technique Junkie stamp set called Vintage Travel Cases - http://techniquejunkies.com/vintage-travel-cases-set-of-5/. I used Antique Glimmers on all of the base pieces -- the background layered on the base card stock, the tag, and even the "picture wheel" cut from background paper. For the picture wheel I used the left over glimmery inks on my craft mat on the picture wheel die cut. . I also stamped the Technique Junkie background stamp Houndstooth Check - http://techniquejunkies.com/houndstooth-check/ - a vanilla piece of card stock. I used black Stazon ink and let it dry. Then I dipped it in Antique Glimmers over the ink. I used Stazon ink so the ink wouldn't run and create a mess. I used this piece of card stock to cut out the word "Journey" and to cut two of the vintage cars. I used a black marker to color the canopyin the top of the card and the wheels. There is a second car inside the card. Wasted - http://techniquejunkies.com/wasted/ and Key Script - http://techniquejunkies.com/key-script/. I stamped and heat embossed the couple on the tag and a smaller scrap of card stock. From the smaller scrap of card stock I cut strips of just the heads to fit in the windows of the picture wheel on the front of the card. 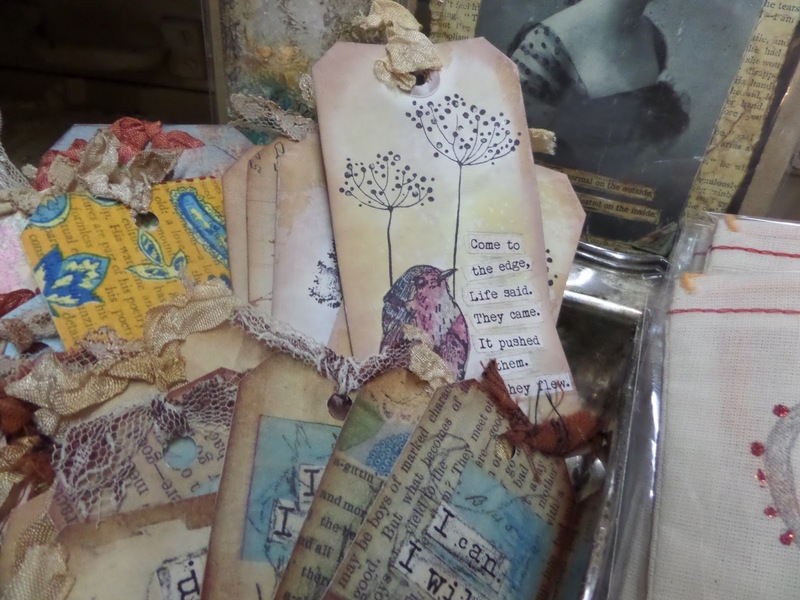 A few ribbons and the filmstrip are the "embellishments!" 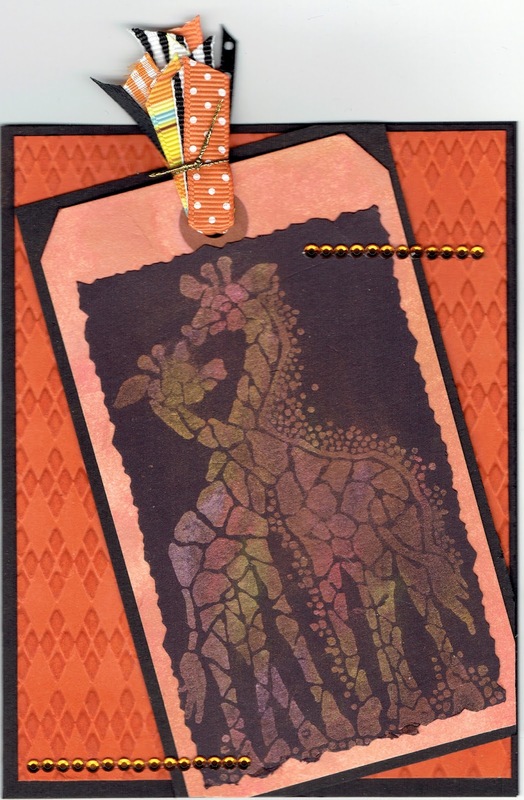 Do you use die cuts on your cards? I have eight grandchildren (Not all 8 of the cards are shown here.) and I always send them a Valentine's Day card. This year I decided to make each one a "box card." I found a Sizzix die for making the cards. 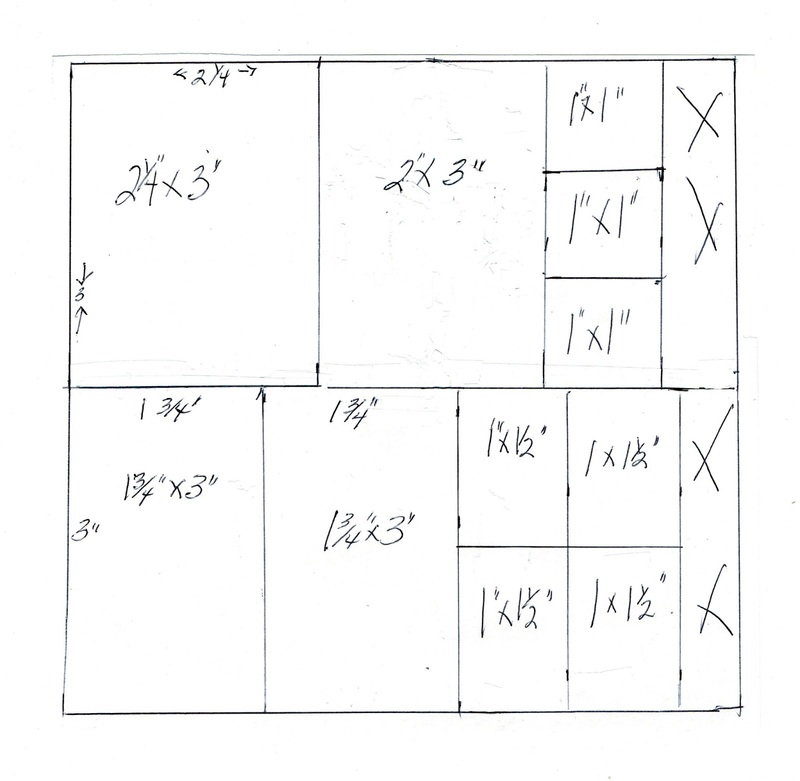 Even though I have all the measurements for making these box cards with just a few turns of the crank on my Big Shot. I used a lot of Valentine papers and some glitter paper I had in my stash, and both heart dies and punches to punch out all of the various heats you see. I used acetate to hold the hearts up so it isn't as easy to see. The layers on the flaps are from various background papers I had in my stash. The stripes are for the boys and the flowers are for the girls. I save the acetate from packaging and I cut off the edges where it is curved and formed around whatever is inside. I then save the flat sheets of sturdy acetate for projects like this. I also include a small piece of candy (or candies) for each one. The verse stamp comes from a Technique Junkie stamp called Simple Sentiments 1b - http://techniquejunkies.com/simple-sentiments-1b/ . 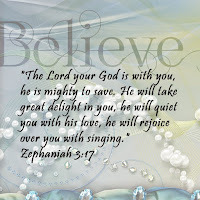 There is a nice collection of verses in this set for quite a few occasions! Do you give Valentine's Day cards to the children in your family? Have a wonderful Valentine's Day! And get inky! Since I would be using the Technique Junkie stamps from Vintage Travel Cases for this personal challenge http://techniquejunkies.com/vintage-travel-cases-set-of-5/, I decided to look through my stack of vintage looking papers to see if there was a way to use any of them. I found this dapper looking gentleman, and thought about his traveling on a long trip. 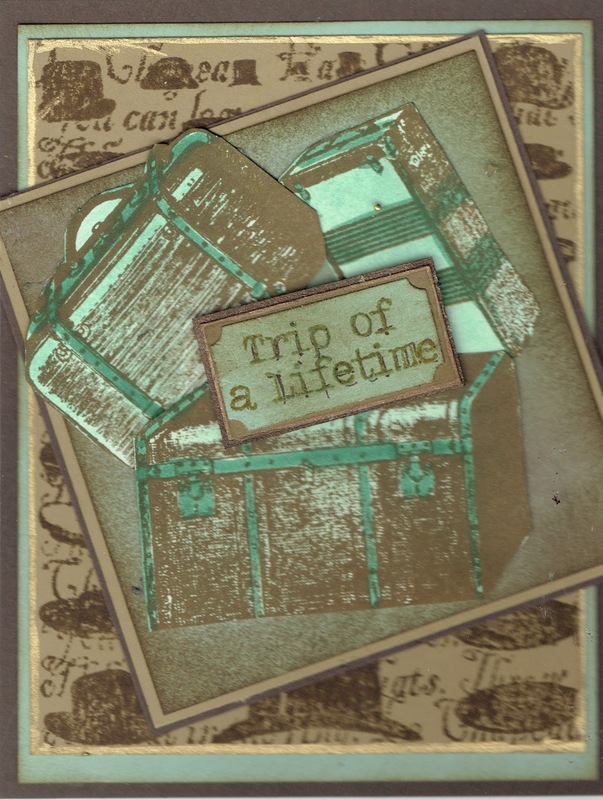 So I stamped the various size of the luggage in this stamp set with brown pigment ink and cover them all with clear embossing powder and heat embossed them all. Then I fussy cut all of those pieces out and stacked them around near his feet. Then of course he would need his tickets for his long trip. I stamped the words from the Vintage Travel Cases set with brown pigment ink, covered it with clear embossing powder, and heat embossed the word. I punched out the words with a smaller ticket punch and then punched out three tickets with a larger punch out of background papers for the rest of the tickets. The smaller ticket is slightly offset and that makes it looks much smaller than the others. I wonder where this gentleman is going on his "Trip of a Lifetime?" Perhaps he will travel on a ship from America to over to Europe. Or perhaps he a train tycoon and is traveling on one of his trains to see the "Wild West?" Is his trip business or personal? Where does your imagination take him on his trip? Have a great day --- and get inky! We all set personal challenges for ourselves from time to time. I have met some folks who wear a "Fit Bit" (or something similar) and have a personal challenge of having so many footsteps a day. Some folks may have a challenge of drinking so much water before noon. Whatever the challenge is -- it is always something that a person wants to achieve in a certain period of time. 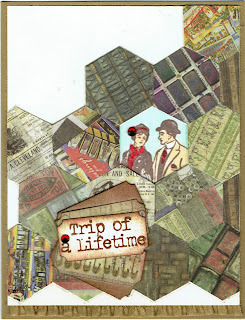 I challenged myself to see how many different cards I could create with one Technique Junkie stamp set -- "Vintage Travel Cases" - http://techniquejunkies.com/vintage-travel-cases-set-of-5/. So from now to the end of February (with the exception of the day after Valentine's Day when I will have a special project to share on my blog) nearly every card I post will be made with this one Technique Junkie Stamp set. I will add in a few others on occasion. But there will be at lest three cards each week created with this one set. 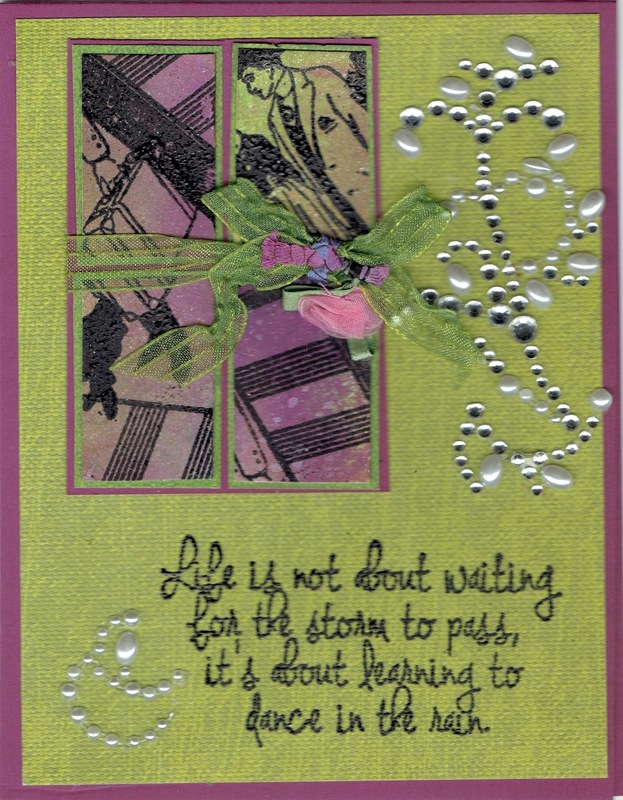 I may use background papers, other Technique Junkie stamps, punches, die cuts, and etc. 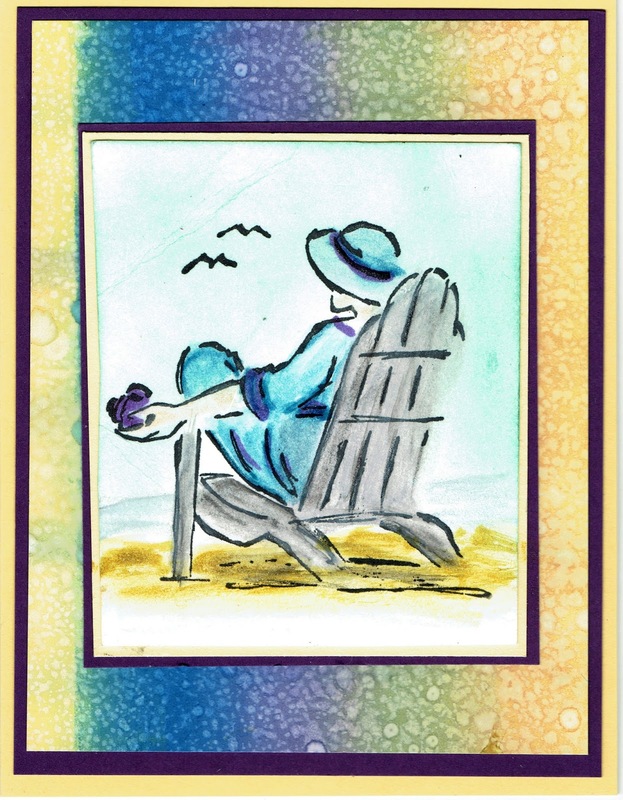 but each card will feature this one stamp set in one way or another. 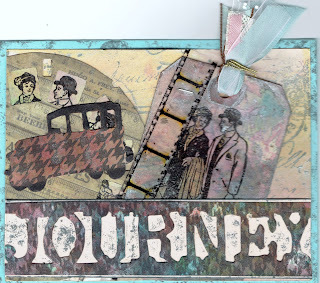 By the time I have finished with this challenge (counting the first two cards for the February 1 Blog Hop) I will have created 14 unique cards with Technique Junkie set called "Vintage Travel Cases." I will be sharing these all with you over the month February. 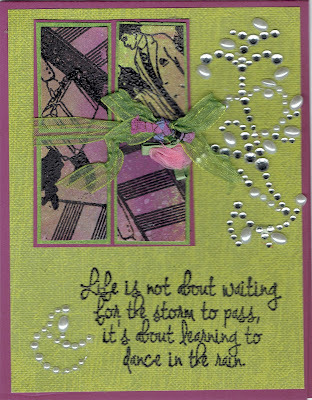 I used a lot of different Technique Junkie stamps on this card. I am going to list them and I don't remember in what order I used them but I I am not sure that matters. I did use a piece of background paper to start with and then altered it with stamps and sponging. 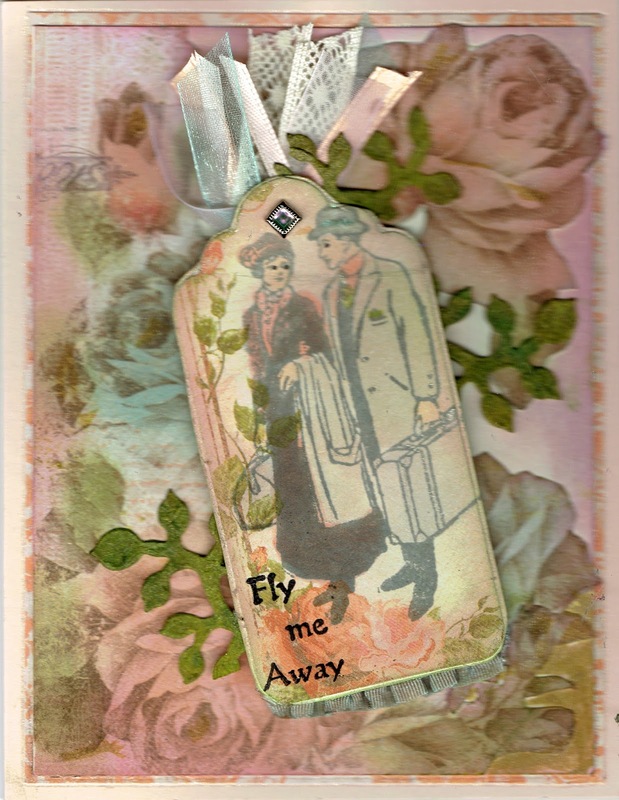 So I used these Technique Junkie stamps on the background and on the tag. Both pieces also has pale Antique Glimmers applied to them before I stamped the stamps. 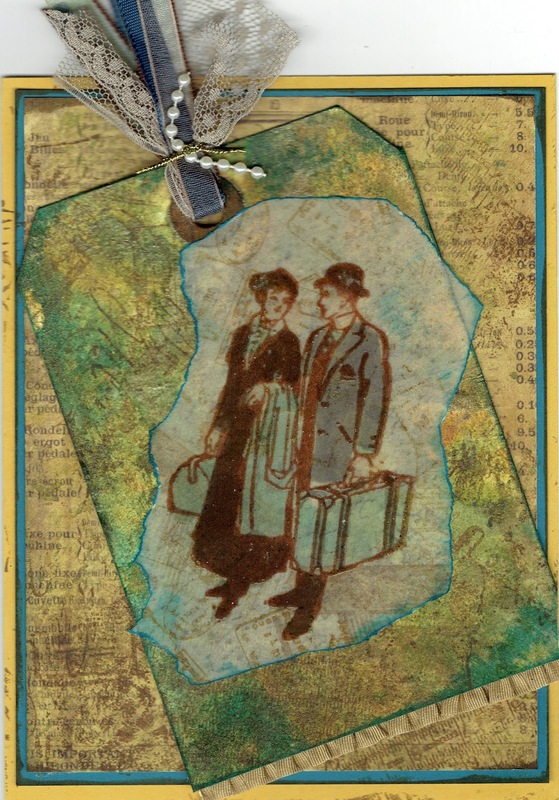 I sponged around the edges of the tag and around the vellum piece i stamp the couple on. I used my Copic Markers to color on the front of the vellum piece. I ran the vellum through my Xyron machine to attach the adhesive. I tied a few ribbons on the tag with a piece of gold cording and a few pearls. How have you challenged yourself personally? Is it something you can share? I created a panel strip with the Technique Junkie Hats Off background stamp http://techniquejunkies.com/hats-off/. I chose the section of the stamp that had the larger hats. 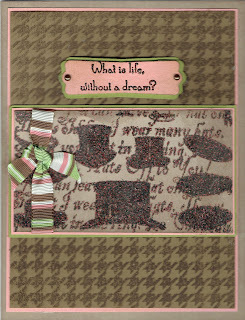 I used the Houndstooth Check Technique Junkie background stamp http://techniquejunkies.com/houndstooth-check/ with a dark brown ink on a light tan card stock. Then I wondered what colors to use for layering and just couldn't decide. I knew I wanted to tie a ribbon around the panel -- but what ribbon? So I chose this ribbon with dark brown, pink and green stripes. Then I used oink and light green papers to match for the layer. 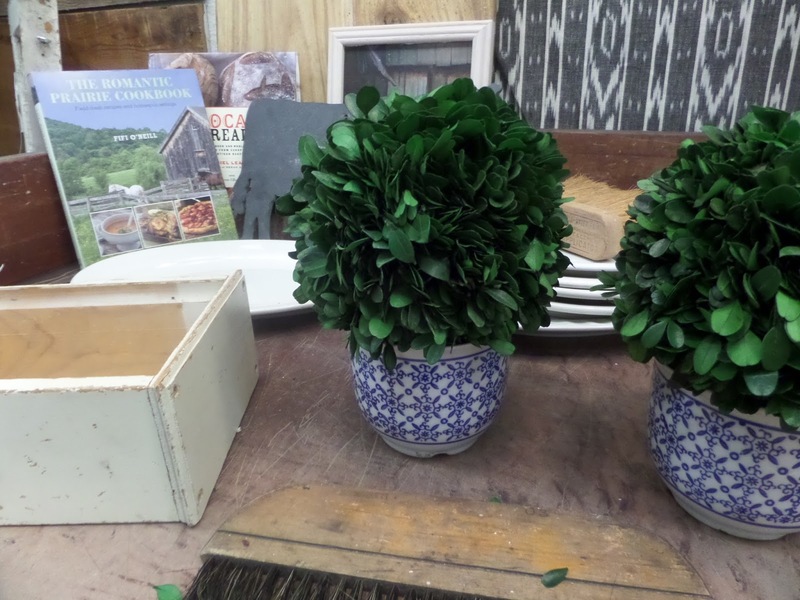 Have you ever done that -- used ribbon as the basis for choosing your layering? Usually i do just the opposite I choose the ribbon to go with the colors I chose to use. So this was a different way to decide on my ribbon for this card. So as before I worked on creating new cards from my card parts box (basket). After making a slew of cards, I was almost disappointed that I still had nearly a full box of cards stuff. I will tell you what I know about the parts but I may not everything. The last time I did this I had several people comment that they had a box or basket like this too. The above card has a brayered background sprinkled with either water or salt. 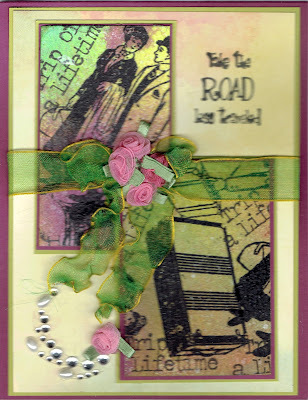 The focal image stamp is from Stampin' Up. The above card uses a technique with acrylic paint but I don't remember what technique it was. Hetty said she was going to start writing the name of the technique on the back of her card parts. Good idea and I will do it --- next time. The focal image is from Paper Bag Studio. This is another technique that I don't remember what it was or how I did it. Nor do I remember whomakes this stamp but i know it has been around a long time. 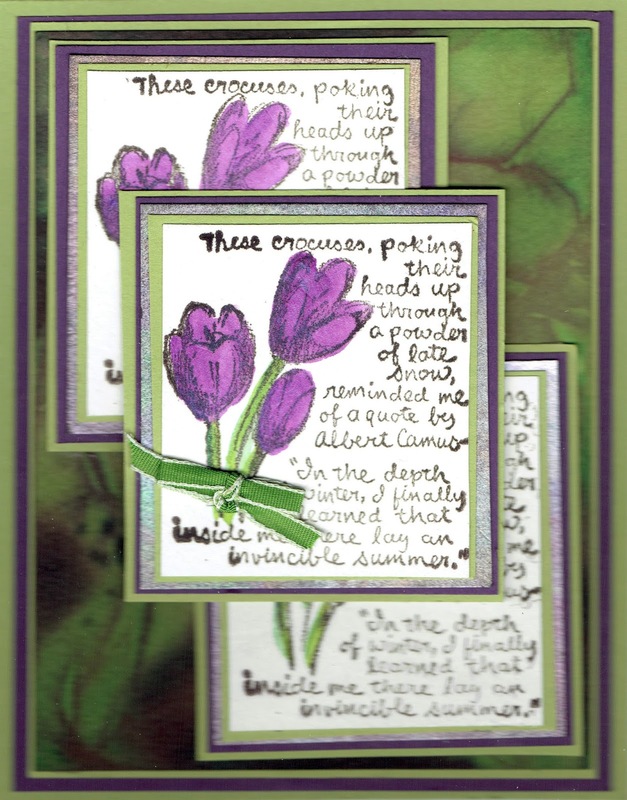 The three focal images here are from Stampin' Up. It is a long retired set. They were colored in with water color pencils and then blended with a water pen. The background is done with cling wrap and paints. 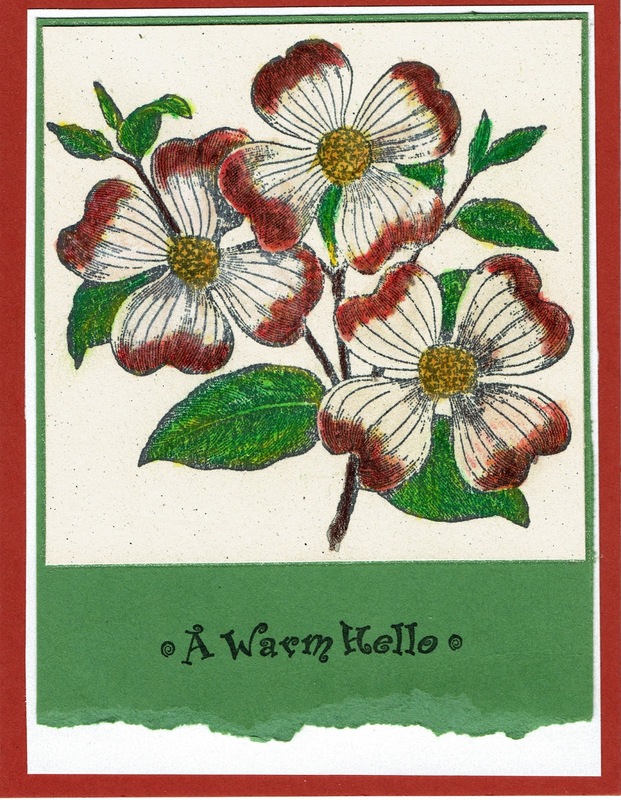 The dogwood is from a stamp company whom I don't remember, sorry. The greeting is form Stampin' Up. The flower is colored with water color pencils and then I used a water pen to blend and smooth. 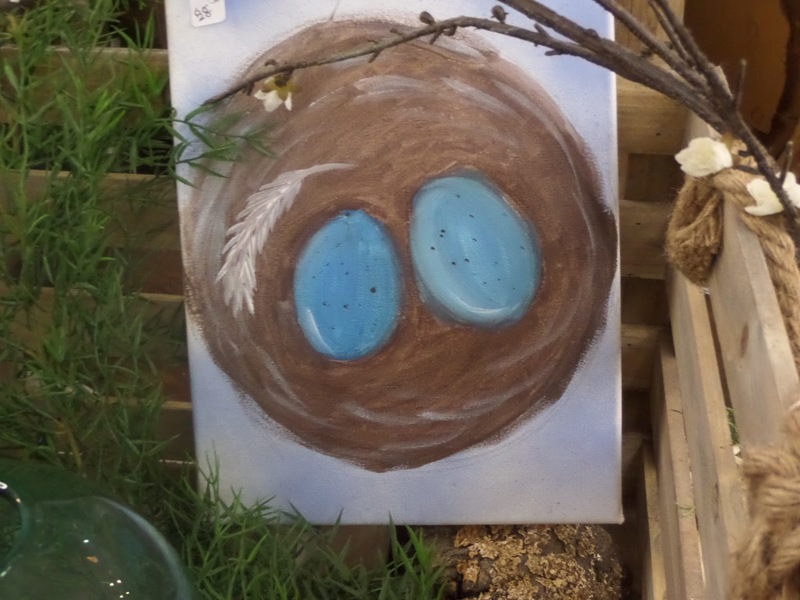 The small background piece on the left is done with the Polished Stone technique. 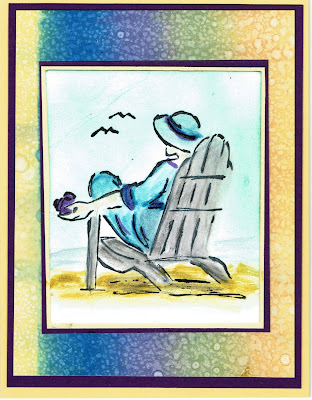 The focal image was colored with dye based markers from Stampin' Up. I think the stamp is from Heather' Stamping Haven which has now closed. 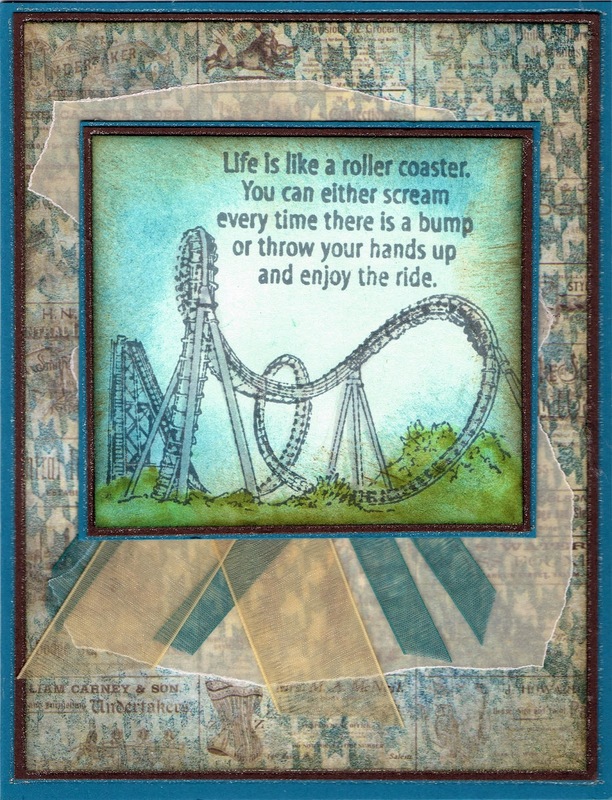 I ran the background layer on the base card through an embossing folder in my Big Shot machine. The light salmon colored tag was done with Antiqued Glimmers. The giraffes (from who knows?) colored with Perfect Pearls over Versamark. 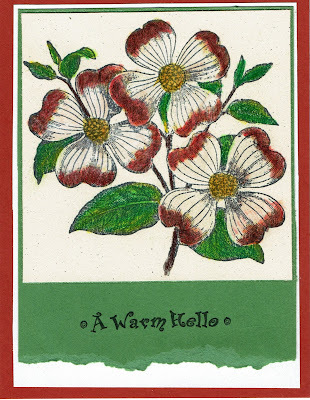 So there you go -- and I still have two more sets of cards to show you! This is the time of the year when I really am looking forward to Spring and summer -- my two favorite seasons of the year. While I enjoy a good snow storm, once a season is enough for me! Spring and summer do not last enough for me. I know there are people who truly love winter and all the outdoor winter activities, but I am not one of them. I used a dark green ink on a lighter green paper to stamp the Houndstooth Check Technique Junkie stamp. I layer that on a pale blue card stock and the n on the base card of dark green card stock. Then I stamped the section with the butterfly of the Technique Junkie Vintage Botanicals stamp http://techniquejunkies.com/vintage-botanicals-collage/ . I used Copic markers to color the butterflies. I layered one as the main focal image. 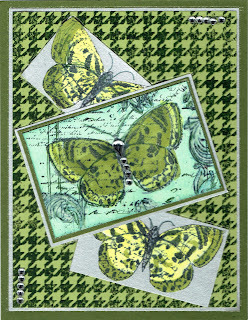 I fussy cut the other two butterflies and layered them on the same pale blue card stock as the other layer. I drew in the antennae of those two fussy cut butterflies. I added a few stick on rhinestones in opposite corners to finish off the card. The Technique Junkie focal image of this card is called Like A Roller Coaster http://techniquejunkies.com/like-a-roller-coaster/. I used my Copic markers to color the image and then sponged around the edges with a soft blue, brown, and green. It is bordered in brown and blue. 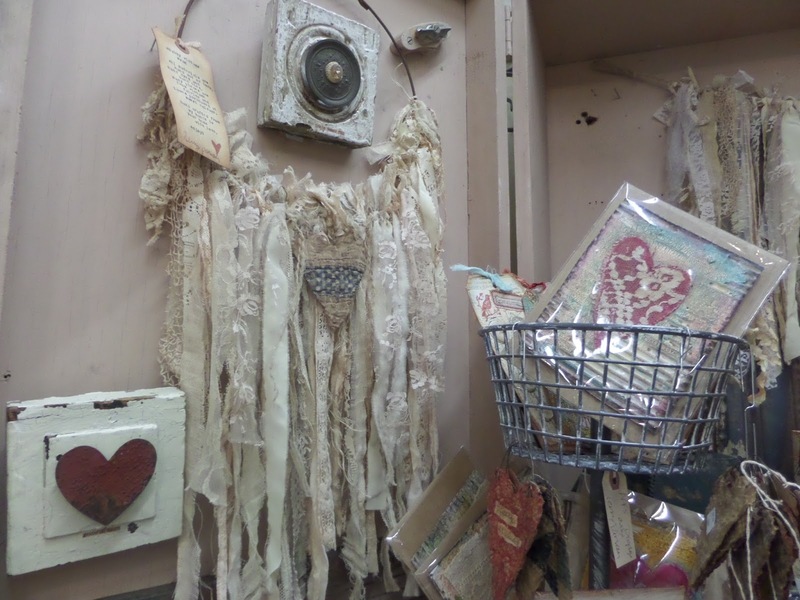 I place the ribbons behind the focal image piece with red line tape. Then I layered all of that on a torn piece of vellum with my adhesive behind the focal image. The Technique Junkie background stamp is called Houndstooth Check http://techniquejunkies.com/houndstooth-check/. I stamped it first and then used that card stock and applied the Antique Glimmers technique to the stamped card stock. It gave the black ink a muted look. Happy February! NewTechnique Junkie Vintage Stamps on Sale!! Happy February 1! Happy Blog Hop Day for Technique Junkie Stamps - it is a wonderful day!! Every time the Design Team for Technique Junkie Stamps gets our new stamps, each member wonders what do I do with these stamps? How can I make these stamps stand out? So hopefully every member of the Design Team has done just that! Each member of the Design Team is so talented and uses stamps in a variety of ways. Every artist brain looks and works at these things differently. I always find it so interesting how different we all work and yet how interesting every card or project is! Doesn't the Design Team produce such interesting and delightful work? Don't forget that all of the newly released stamps for February are on sale for 15% off until February 8th. The percentage will come off automatically. If you haven't started at the beginning of the Blog Hop, please start there: Design Team Blog http://techniquejunkies.blogspot.com . My blog is second -- right after the Design Team blog. And now to my cards for your Eye Candy and viewing pleasure! 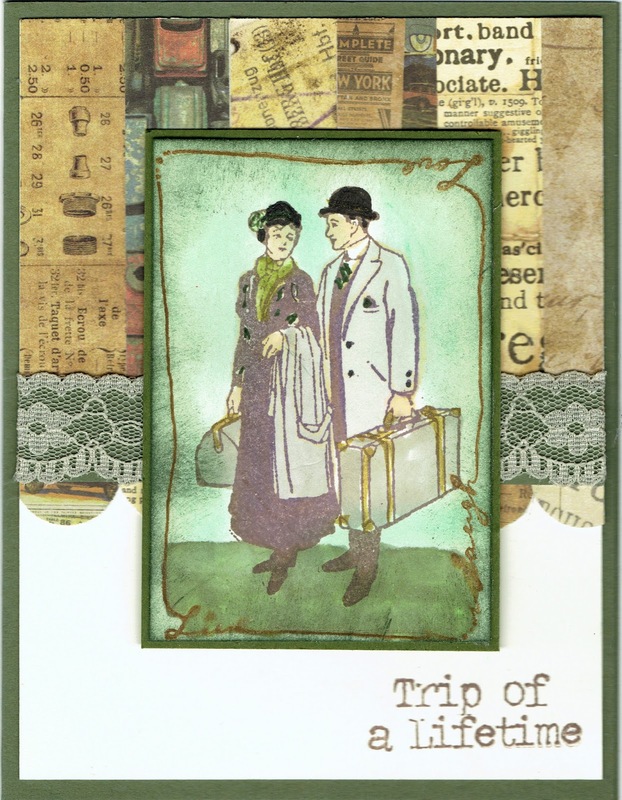 These two cards use the same two newly released Technique Junkie stamps or sets: PS012 - "Vintage Travel Cases" http://techniquejunkies.com/vintage-travel-cases-set-of-5/, and PO32 "Hats Off" http://techniquejunkies.com/hats-off/ . 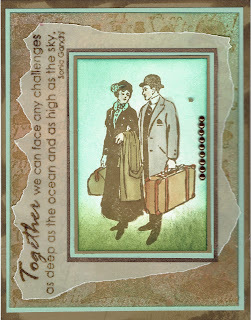 And my second card also uses a Technique Junkie stamp called "Together" --http://techniquejunkies.com/together/. 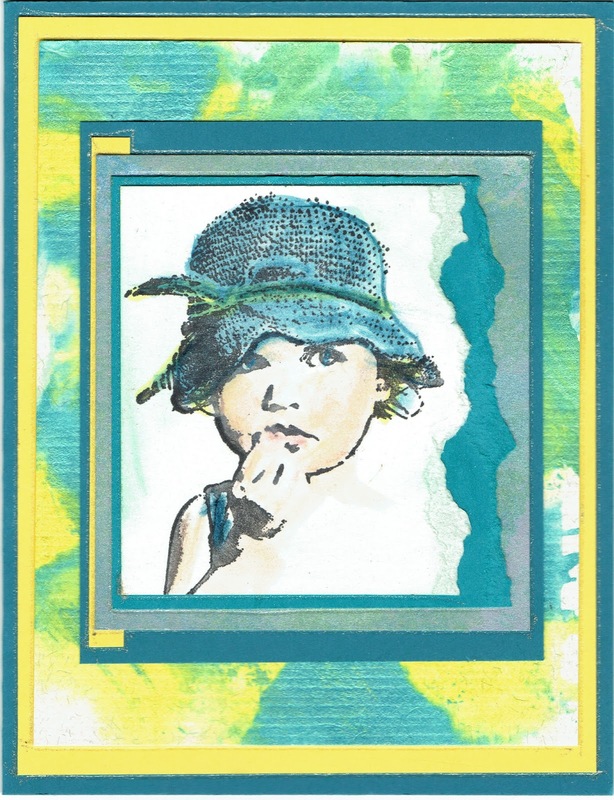 Lots of layers, coloring with Copic markers, sponging, and embellishments -- Ta Da! two cards done! 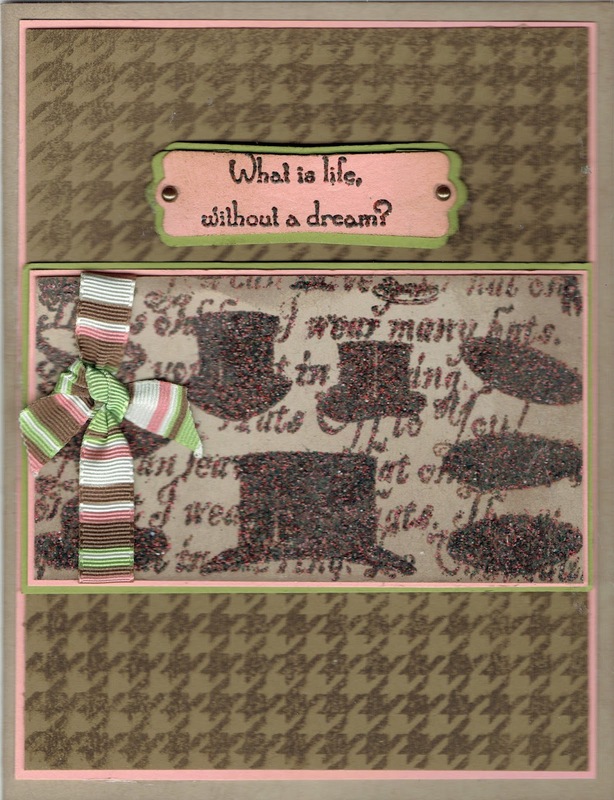 I have one more card for you with a newly released Technique Junkie Background stamp called "Houndstooth"http://techniquejunkies.com/houndstooth-check/ , and I also used a Technique Junkie stamp called "Vintage Botanicals Collage" http://techniquejunkies.com/vintage-botanicals-collage/. 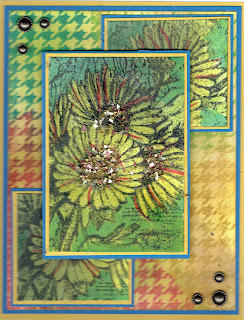 Art Anthology gel mediums on the daisies, and sprayed the background with the Art Anthology sprays. Then I cut out sections, trimmed them and mounted them. Only the top layer has the Prills in the center of the flowers. 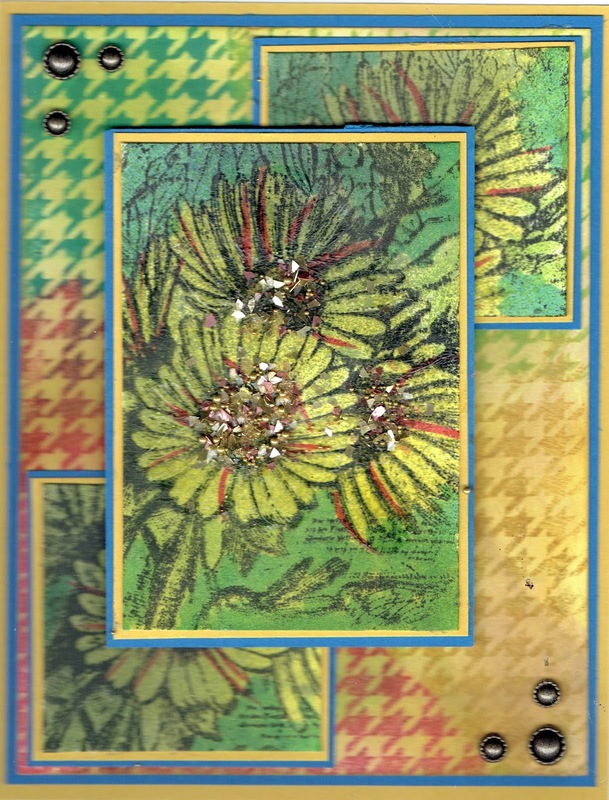 The bottom two flowers are adhered with my ATG tape runner, and the center flower image is popped up underneath the top left and the bottom right corners. The other two corners are adhered with my ATG tape runner adhesive. A few antique looking stick on bling are in the corners. Karen McAlpine http://dreamingncreating.blogspot.com Please visit Karen next. 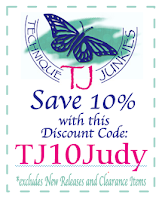 Don't forget, all of the new February Release Technique Junkie stamps are on sale 15% off until Feb 8. Be sure to shop soon! Are you getting inky this winter?